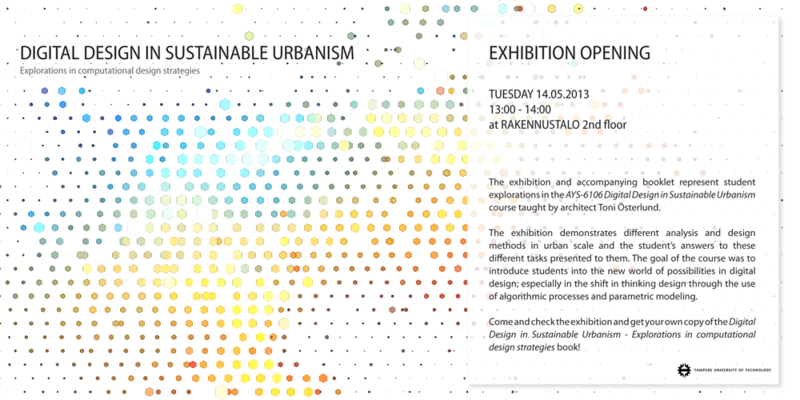 New student exhibition called Digital Design in Sustainable Urbanism – Explorations in computational design strategies was opened 14th of May at the Tampere University of Technology. 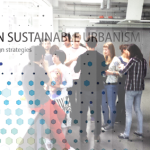 The exhibition and accompanying booklet represent student explorations in the AYS-6106 Digital Design in Sustainable Urbanism course taught by architect Toni Österlund. 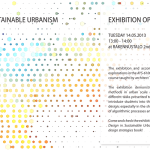 The exhibition demonstrates different analysis and design methods in urban scale and the student’s answers to these different tasks presented to them. The goal of the course was to introduce students into the new world of possibilities in digital design; especially in the shift in thinking design through the use of algorithmic processes and parametric modeling.